We know meeting someone for the first time can be intimidating, and visiting a new church can be nerve-racking. We want to make your first experience at 3Crosses a great one! We've put together some simple information to make your first visit easier. From the moment you walk up to the building, we want you to feel like part of the family. Everything we do at 3Crosses is about LIFE TRANSFORMATION THROUGH FOLLOWING CHRIST. This transformation happens as Jesus draws lost people to himself, saves them through His Gospel, and grows them into his image. Thus, life transformation is an ongoing experience that lasts our entire lives, as God uses His Spirit, His Word, our community and our experiences to transform us. So as a church, we find creative ways to reach people with the Gospel of Jesus. We provide exciting programs for children and students. We build relationships with our friends, family, and neighbors and share our transformation story. We preach and study God's Word. We utilize the arts to tell the story of the Gospel. We share meals, friendship, and prayers with the homeless in our community. We partner with organizations in our community and around the world that are introducing lost people to Jesus. We do all these things and more to introduce people to the One who transforms. This is 3Crosses. This is Life Transformation Through Following Christ. Our purpose at 3Crosses is Life Transformation Through Following Christ. Everything we do is designed to help you be transformed in your relationship with Jesus. This is true for our Sunday services as well. Our music is centered on the character and work of God. Our sermons take Biblical texts and apply them to your life. Every week we tell the story of Jesus' death and resurrection, trusting that this message is "the power of God for the salvation of everyone who believes!" From the moment you drive up the hill and into the parking lot, you can expect that there will be men and women who will help you and make sure you feel welcome. We'll help you find a parking spot. We'll say hello to you and answer your questions when you enter the building. We'll help you find a seat in the auditorium, the check-in kiosks for your kids, or a classroom for Community Hour. If you have any questions, head over to "Connection Central" and we'll get them answered! 3) Expect for Your Kids to Have a Great Time! We have an amazing, fun, safe environment for kids at 3Crosses. Every week, kids from 3 months to 18 years of age come and have a great time engaging in age-appropriate activities and teaching. We often hear families say, "We wanted to just check out 3Crosses for one week, but our kids made us come back again!" Your kids might love our Children's Ministry so much that they start dragging you to church! 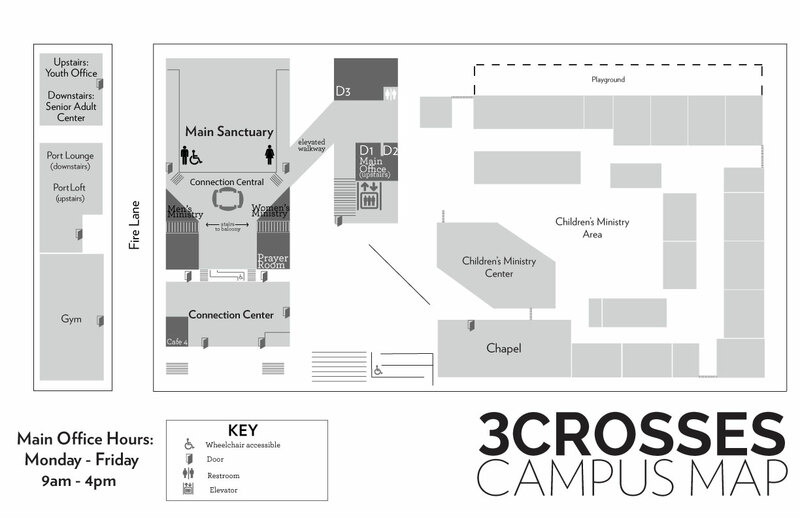 3Crosses is a big church, and at first, you'll think, "How will I ever meet anyone here?" We know our church is big, and so we've developed a ton of smaller communities that will help you get to know people quickly. We have amazing communities that meet on Sunday morning from 10-11 all over the church as well as mid-week and home communities for every age and life-stage. If you need help connecting into community, visit "Connection Central" in the lobby or browse through them on our website.